Alexander von Humboldt was born one day like today in 1769. 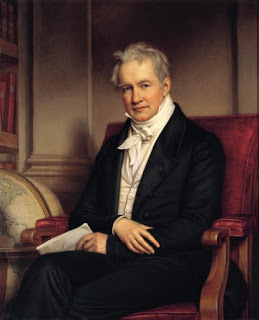 Here you have an interesting article - in Spanish - about global warming and Humboldt. I wish scientists could carry out the same kind of experiments in Venezuela as they did in Ecuador now and see what level of environment destruction has taken place in what he visited 215 years ago. Unfortunately, Venezuela is now a complete failed state so that it is almost impossible to carry out scientific work without getting mugged or worse. Oh, Alexander! If you saw how much Venezuelans have managed to destroy their environment!